Why? Forty-eight million is the current estimate of people with deafness or hearing loss in the USA alone. Not all need CART. Some use hearing aids or other listening devices for full speech comprehension. (Keep in mind many hearing aids wind up in drawers, never to be seen again, because hearing aids do not cure hearing loss, and are uncomfortable for many; the result is that some deny any hearing loss and learn to “bluff” extremely well). Real time captioning (CART/STTR) is a universally appropriate language (in whatever language you use) for all who can read. It is used by people who are deaf, deafened, or those with hearing loss. (Some deaf prefer use sign language, yet the majority of people who are deaf, deafened, or have a hearing loss use captioning). CART provides an easy record (a transcript) of what is said, leading to the best possible health outcomes and proper treatments. While talking with your provider, when you or the government is paying for the best healthcare one hopes to find, it’s essential not to miss a word. The CCAC website has a number of videos under the “resources” tab to illustrate what CART is. If you believe the cost of CART or captioning is too much, consider what the patient deserves, and consider the obligation to do no harm. This ADA Business Briefing – Communicating with People Who Are Deaf or Hard of Hearing in Hospital Settings – discusses how the law applies to communication access in a healthcare settings, just as it applies to wheelchair access. There are ways to budget for CART (on-site or remote delivery of full verbatim text), and for a 30 minute consultation, or even more, the cost is fully manageable. There is a “learning curve” to this. Afterward, for an estimated five percent of the population who requires this for inclusion, you will both benefit from the quality of care delivered. There is also a need outside of the direct patient and healthcare provider relationship. So many Health Education Videos online do not have quality captioning. Does your health agency use video information online? Is it captioned? If not, come talk to the CCAC, we want to make this happen. 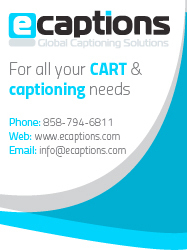 There are many good volunteers and many excellent professional captioners who want to assist. Below is a too short, partial list of hospitals and medical facilities that (sometimes) offer CART. What about your health center? Is CART available on request? Are health videos online captioned? Tell us about it so we can add it here. UPDATE OCTOBER 2012: These days new technologies and mobile devices can bring professional real time captioning into medical settings much more conveniently, onsite, or remotely, even in operating rooms. Handheld and tablet computers display every needed word said, by any voice, for the patient who is hoh/deaf/deafened. Some medical centers are well aware of this; many more will want to learn more about the need, and the technologies. UPDATE NOVEMBER 2013. So many CCAC members and others continue to report lack of awareness, large gaps in resources, and lack of captioning for healthcare. One most typical example – for recent surgery, a large clear typed sign was placed by the family above the hospital bed and nevertheless, most of six nursing staff each day did not face the patient when speaking. CART was not requested, yet there must be a better way to minimize stress for a patient with hearing loss. In hospital for seven days, with different nursing staff each and every day, the patient’s repeated frustrations in communications did not help in healing. *SL (sign language) is needed by some people with deafness and must always be provided if needed. While many millions with all forms of hearing loss and deafness are good readers, and many speak well too, there are some SL users who require and deserve interpreters in medical settings, no matter what the planning or cost, just like Live Captioning and Media CC for so many others.